Vietnam will cooperate South Korea to develop its herbal potential of the Southeast Asian country and the Vietnam Korea Institute of Science and Technology (VKIST) will supply techno solutions to Vietnamese enterprises, said VKIST President Dr. Kum Dongwha. Scientists admitted that there has been a gap between research to production and trading. Scientists are not familiar to advertise their research product, they are subsequently reluctant to do whereas enterprises are unattractive to Vietnamese technology while potential and knowledge of herbs in the country is very huge. Representatives from Traphaco and Nam Duoc Company which are successful in making herbal drugs said that cooperation between research institutes and enterprises is needed to sell an herbal product in the market. Their good examples of research-enterprise cooperation are a brain drug named Hoat huyet duong nao and Boganic. The two companies earn VND400 billion ($17,215,432 ) annually from selling the products. 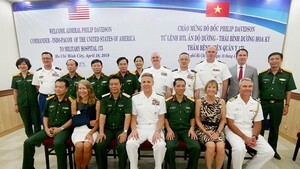 The Commander of the U.S. Indo-Pacific Command (USINDOPACOM) led by Admiral Philip S. Davidson yesterday visited the Military Hospital 175 with the participation of Consul General Mary Tarnowka.